I’m a great fan of Amélie’s writing and she’s done it again with another story that’s gripped me and left me desperate to know more. I’ve written to ask if this is a 2 or 3 parter, and some rough release dates for the rest. Edit: Amelie says this is a three parter with part two due in Feb/Mar 16. Thankfully Amelie never keeps us waiting too long. Its a dual POV read, with chapters from viewpoint of both Piper and Brody. I like that in a novel, it allows me to understand characters, how and why they act, more so than single POV reads. When we first meet Piper she seems a “good” girl, ambitious, works hard at her education, focussed on following her dad’s footsteps as a global journalist. He died some time back, and as well as being a journalist he was also a biker, and her mum accompanied him – biker societies have their own rules – and now her mum is remarried she’s putting that part of her history into cold storage, as if it never happened. She’s remade herself to suit her rich new husband, the obnoxious Royce. For UK readers Royce reminds me so much of the TV sitcom Fools and Horses character Boysie in the sleaze factor, but without the thread of decency and morals Boysie has deep – very deep! – inside. Piper’s Professor though, the one she really wants to work with in the next year wants something passionate, different, adventurous from her in a writing project, she’s down to one of four for the two last places with him, and has to come up with something quickly. Add to that pressure the need to find work to cover her tuition etc and its going to be a tough few weeks, as her original plans for work have been derailed. Then she meets Brody and Seren…. Seren is cute, really sweet and going through something really tough, and living up some dreams with others in her situation. Brody is with her, its a complicated situation involving him, Seren and his best and long time friend Cole. Cole’s a SEAL and away so it’s Brody that’s currently with Seren on her adventure. There’s a sizzle of attraction as soon as he and Piper see each other, and soon as she hears what Seren is doing it sparks an idea for her school project. It fits in well with her changed plans too, and of course getting closer to Brody is an incentive…. and she’s soon in the group. 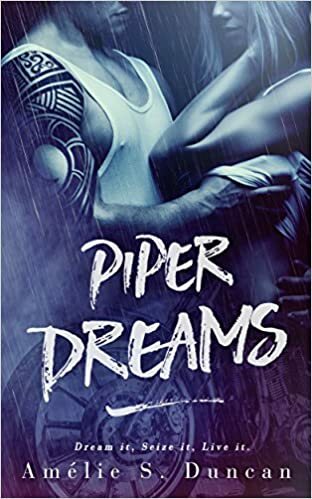 There’s some terrific characters here, some fun and scary times, and Piper and Brody are really pulled towards each other. Piper doesn’t want to get involved in the “complicated” part, but can’t seem to keep away from Brody. He doesn’t want Piper because of the complications and yet he too can’t seem to keep his hands off, and they end up in some seriously steamy and sensual encounters. The issues though, the complications are still there, lead to some hard choices, some on and off moments and when towards the end of the book Cole gets involved it gets even tougher. I loved Piper, was angry at her mum and as for Royce, eurghh – a real sleaze. In Seren’s group I found some great characters, and of course Seren and Brody. Seren was so cute and yet determined and focussed on some things. She’s at times almost selfish and yet in her shoes who can say they’d be otherwise? Brody I wanted to hit with something heavy…he’s been hurt in the past but that’s not Piper’s fault. He’s in the situation with Seren but that could be got round if he just wanted to work at it, but one moment he’s all go, go, go and then its brakes on, complications, I can’t do …..and as for Cole what a selfish man, he could be with Seren I’m sure but wants to push that off onto Brody and stay with his SEAL pals. I know they do a tough and essential job but its something he chose to do, wasn’t forced, and I just think he’s taking a cop out and using his friend. Still, when that kind of thing happens to me it always seems to mean the author – Amelie in this case – is going to make me have a complete turnaround in thought in next book!! Stars: Five, its not a stand alone, but stops at a natural break point though leaves me wanting more Now!